With the new Podcasts app for iOS, Apple has created a one-stop-shop for finding, downloading, and enjoying podcasts. Podcasts have long been a bit neglected in the iTunes and Music apps, and the new aspires to obviate the podcast features of these earlier apps. It’s a promising first release. Even though the app still needs a bit of work, Podcasts offers capabilities that many users will find compelling. The Podcasts app is divided into two parts: the Library and the Catalog. You can think of the Library as ‘your podcasts’. It lists the podcasts present on the device. There is a distinction between subscribed and unsubscribed podcasts. This is a distinction is important because you cannot download episodes of a podcast you have not subscribed to, even if episodes of that podcast are present on your iOS device. The interface does not make the distinction between subscribed and unsubscribed podcasts very clear, but there are a couple of ways to tell. For unsubscribed podcasts, only episodes present on the device are shown. For subscribed podcasts, all recent episodes are shown, whether or not they are present on the device, and a small download button appears next to the names of episodes that have not been downloaded. Also, if you tap the little gear icon in the upper right corner, a menu of options appears in which you can choose whether to subscribe to the podcast or not. This is where you go to find new podcasts. The Catalog is essentially the Podcasts section of the iTunes Store, without the distractions of Movies, TV shows, Books, Audiobooks, and Music. The Catalog hosts exclusively free content. This means when you’re browsing for content in the Catalog section of the Podcasts app, you don’t have to think about how much things cost. This is the first app from Apple that has let you subscribe to podcasts right on your iOS device. This means it is no longer necessary to use iTunes on a Mac or PC, or to download individual podcast episodes from the iTunes app for iOS. Just view the details of the podcasts in the Podcasts app, click subscribe, and download the episodes you want. Unsubscribe later if you find that the podcast is not your thing. You can also enable automatic downloading of new episodes, meaning there will be new stuff for you to listen to each time you open the app. Great! Initially, I felt that the new Podcasts app blurred the distinction between downloading and streaming. However, this impression was a misleading one. In fact distinguishing local (already downloaded) content from content that has not yet been downloaded is quite simple. In both the Library and the Catalog, if a podcast episode does not have a download button next to it, the episode is present on the device. The user interface and layout of the controls is quite inconsistent between the Library and Catalog though, and there are some obvious oversights. For example, when viewing a podcast in the Library, there is no way to switch directly to that podcast in the Catalog. Similarly, there is no way to quickly switch from a podcast in the Catalog to the same podcast in the Library. One gets the impression that the Podcasts app is two separate apps in one: a new app for viewing locally-stored podcasts, combined with the Podcasts view of the iTunes (iOS) app. The marriage of these two views is done in a somewhat inelegant way. It really feels like two apps. It the iTunes app for iOS, there is a Downloads that displays all the items that currently being downloaded. The new Podcasts app lacks a Downloads view. Interestingly, if you start a download in the Podcasts app, the iTunes app’s Downloads view does not show the download. However, both the iTunes app and the Podcasts correctly show which podcasts have been downloaded and which have not. The design of the Podcasts app is a departure from the simplicity and consistency that have marked most of Apple’s other iOS Apps (iPhoto being a notable exception). The default view in the Library is a scrollable list of square tiles, each displaying the photo of a podcast (the photo that would be called the ‘cover art’ for music albums). The scrollable list of square tiles is a bit reminiscent of Windows Phone. Tapping on a podcast’s photo takes you to the list of episodes for that podcast. Tapping an episode begins playback. Following the trail blazed by iPhoto (among other apps), the Podcasts app eschews platform-wide UI consistency in favor of a tailor-made skeuomorphic design. Gone are the standard flat white-on black playback controls. In their place are metallic buttons arranged in a mostly familiar layout. I write ‘mostly familiar’ because there are some changes. The button to skip backward 30 seconds has been replaced by a button to skip back only 10 seconds. In addition to the skip-back-10-seconds button, the Podcast app adds a new button that skips forward 30 seconds—quite useful for skipping ads. The back button behaves a bit differently than before in one situation: when playing the first episode in the list. In the Music app, tapping the back button in this situation stops playback and returns to the list. In the new Podcasts app, it does nothing. Swiping up on the cover photo reveals even more controls underneath, along with an animated Dieter Rams–inspired facsimile of a reel-to-reel tape player. The timeline has been moved here, so it is necessary to slide the cover photo out of the way first before one can scrub forward or backward in the track. Interestingly, the timeline contains what appear to be back and forward skip buttons, but both of these buttons are non-functional. Under the cover photo, you’ll also find a control for adjusting the playback speed, as well controls for sharing and setting a sleep timer. The latter is particularly useful if you, like me, listen to podcasts in bed. 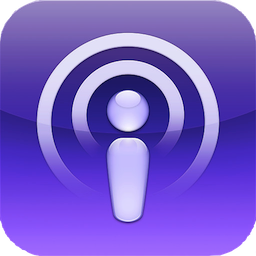 The Podcasts app shares the same underlying library as the Music and iTunes apps, so any podcasts downloaded in the Podcasts app are visible in the Music app, and any Podcasts download in iTunes will be visible in Podcasts. However, when you’ve listened to part of an episode, the place where you left off is not synchronized between the Podcasts and Music apps. This is a first break with the past. I surmise that Apple intends to move Podcasts into their own separate domain, distinct from other media. This initial release of the Podcasts app at once represents a first step in this general direction, and gives clues to the direction Apple is heading in the future. It’s clear to me that the Podcasts section of the Music app will disappear in a future iOS update. Most people accept that iTunes on the Mac and PC has become too big, trying to accomplish too much in a single app. There are rumors that Apple will break out some features into distinct apps. This process has already begun on iOS with the Podcasts app. The Podcasts app is polished and offers capabilities in a single app that previously required using two apps. However, the app is not without problems. First of all, the user interface is quite sluggish. When scrolling, there are jerks and lags. I found similar results on both the iPad 3 and the iPhone 4S. It’s surprising to see such poor performance on Apple’s latest hardware. The Podcast app also appears to freeze at times. I observed that if I launched Podcasts when it was not already running, the list of podcasts appeared immediately, but was non-responsive for about 5 seconds while the list reloaded. It appears that the app refreshes the list of podcasts at launch, and does not accept any user input during this operation. In addition, the app crashed while I was using it on several occasions, and at one point, even caused iOS to restart. It’s clear a lot of attention went into the new Podcasts app. The skeuomorphic tape deck UI might be off-putting to some user interface purists, but I found it mostly inoffensive. The amount of tape on each reel changes depending on the playback position; the reels spin and the tap jiggles periodically; and the tape guide moves out of the way when one jumps forward or backward in the episode. It’s elegant and pixel-perfect, and the attention to detail that went into it is remarkable. However, there is a trade-off between eye candy and performance. That pretty spinning tape deck requires memory, meaning less is available for other apps. This means more delays reloading apps and web pages when you switch back and forth between apps. The animations probably also impact battery life. Obviously Apple feels that the pretty UI elements are worth the cost to performance. Considering app’s responsiveness and stability problems though, I wonder if the right things were prioritized during the app’s development. Overall, Apple’s new Podcasts app for iOS is impressive. Like several recent iOS apps, Podcasts shows that Apple is not afraid to try new things. The app introduces several new UI ideas while borrowing some from elsewhere. Apple obviously wants to help users manage their content more easily, without having to switch back and forth between apps. The dual pedigrees of the Podcasts app is still very obvious though, and some work remains to make the app feel unified and consistent. Even with its problems, Podcasts has now supplanted another app on the first page of my home screen. When I want to download or listen to podcasts, I no longer use any other app—I go to Podcasts. It’s clear that this app is a work in progress, and we can no doubt expect that Apple that will fix the more serious problems soon.